SONC offers eight different cycling events, offering something for every ability level. Events range from a 500 meter time trial to a 40 kilometer road race. SONC Summer Games will be held May 31 – June 2, 2019, in Raleigh. Local programs are encouraged to host and attend local invitationals. Check out the cycling sport calendar for upcoming events. If you are interested in hosting an invitation please contact the sports department at sports@sonc.net. About Cycling: Cycling requires good physical condition, balance, and endurance. Special Olympics include time trial and road race events in different distances. 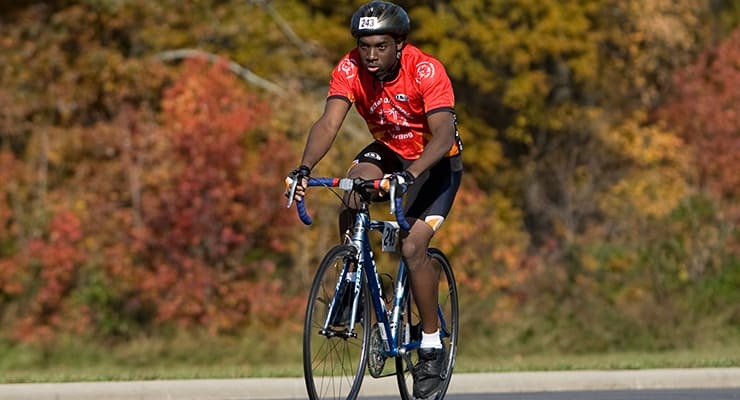 Differences of Special Olympics Cycling: Two main differences are the honest effort rule which is in place for Time Trials, not road races, and the hands off the handlebars at the finish line. Due to safety concerns, Special Olympics cycling prohibits hands off the handlebars at any time, unlike non-Special Olympics cycling where it is common, accepted and expected for winners to raise both hands after or even before crossing the finish line. Cycling is also limited to Time Trials and road races. History: Cycling was first offered as an official sport in the 1991 Fall Games, but it is now one of Summer Games’ most popular sports.